Ask anyone in Duluth – or anywhere in Minnesota for that matter – and they will tell you how dismal the weather has been for the past umpteen weeks. Clouds, dark and heavy have obscured the sun for all but one day in the last 18. It hasn’t helped that these clouds have produced only rain, not any negligible snow for those of us who love winter sports. The lack of sunlight has been depressing to say the least. So like all good northern Minnesotans, we look for the bright side (literally in this case) wherever we can. Christmas lights certainly quality. If daylight disappoints, evenings bring on a bright glow. Driving anywhere in town delivers a showcase of pleasing light displays. 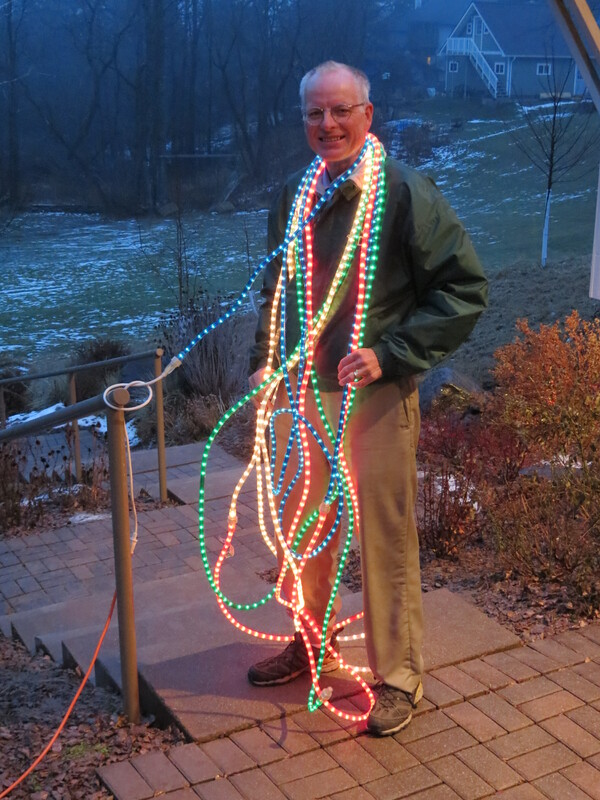 We were a bit on the late side getting our lights up, but Rich headed out one gloomy night to add our own colorful strings to the night time drama. In the midst of this light drought, we passed the Winter Solstice – the day with the least amount of sunlight. So even though we couldn’t see it, the sun made its shortest appearance of all. 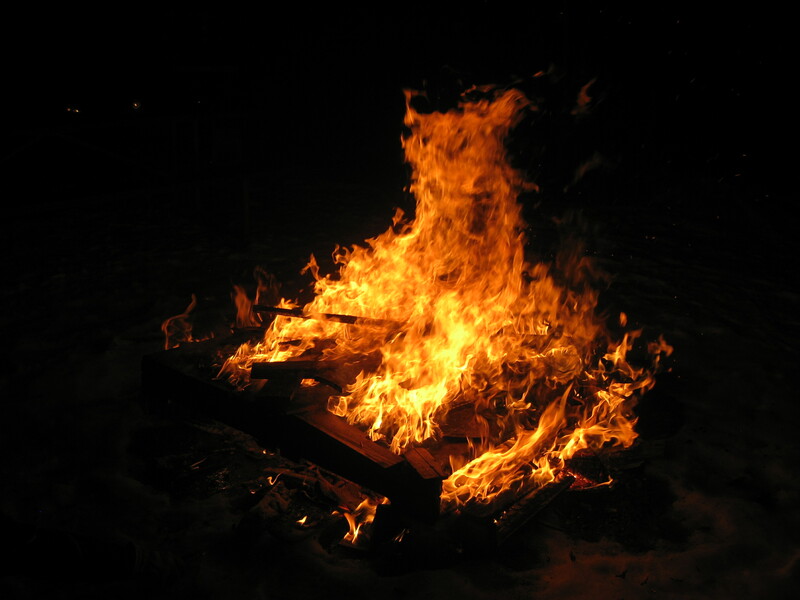 Our ski club has an annual Solstice Bonfire Ski, and the thought of a bright bonfire to light up the night enticed me out there. 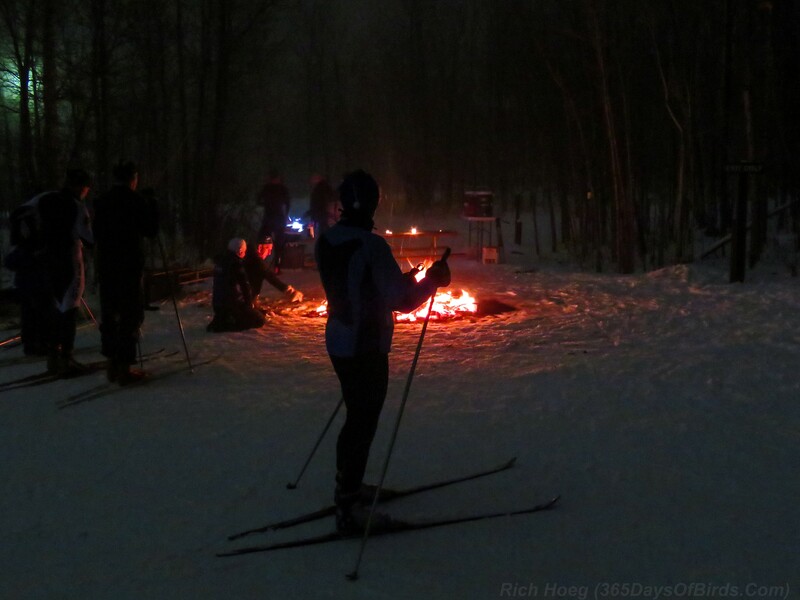 I skied over the trails at Spirit Mountain to find not one but nine bonfires illuminating the way. My particular favorite was the elevated bonfire, flaming away in one of the barbecue grills. The snow far exceeded my minimal expectations, and it was pleasant skiing in the mild temperatures. But it was even better just hanging around the main bonfire. Roasting a hot dog over the fire, singeing my face as well as the dog sure felt good. Wrapped in a tortilla, char-broiled never tasted so good. Spirits were high as we all basked in the light of the fire. Not too surprisingly, by mid-morning the clouds resumed their cover and the world returned to its gray hues. But that short glimpse was enough to get us through and feed our belief that one day the sun will shine again. The ultimate light show. This entry was posted in Life Up North and tagged Cross-Country Skiing, Duluth Minnesota, Outdoors by Molly. Bookmark the permalink.